Princess Beatrix of The Netherlands recently turned 80. 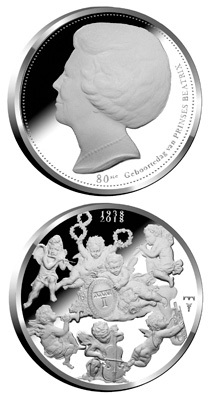 In honor of the 80th birthday of their former Queen on Jan. 31, Koninklijke Nederlandse Munt [Royal Dutch Mint] has produced three portrait medals: a BU cupro-nickel piece in a blister card; a 38.6 mm, 31.1 g .925 fine silver proof; and a 21 mm, 3.494 g .585 fine gold proof. Mintages are 7,500, 500 and 300, respectively. The designs of the silver and gold are identical. For those unused to the ways of Dutch royalty, Beatrix became Queen of the Netherlands in 1980 when her mother, the then Queen Juliana, abdicated. She continued to reign for 33 years until 2013 when she, too, abdicated in favor of her eldest son, Willem-Alexander and resumed the title of princess. 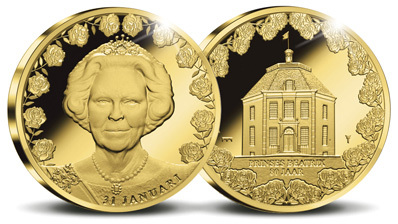 Beatrix was then aged 75 and had become the oldest reigning monarch in the history of The Netherlands.